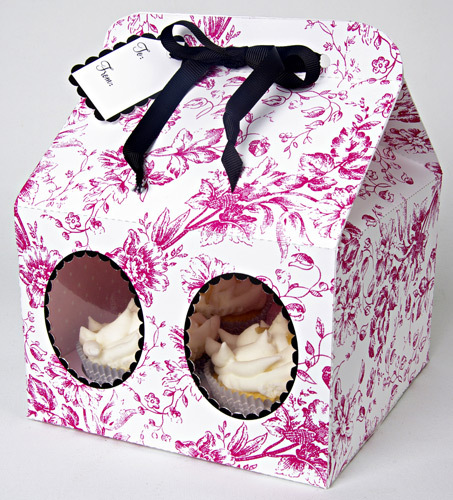 Pink Toile Large Cupcake Box - Cake & Cupcake Etc. A cake box for a real cupcake treat. 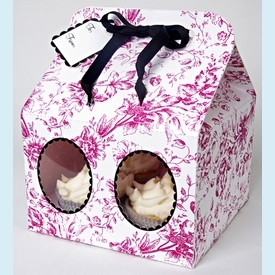 Decorated with a delightful pink toile pattern and a black deckle edge and finished with a satin bow this cupcake treat box contains 4 trays for your finest sweet creations. Large treat box with removable tray holds 4 cupcakes. Pack contains 3 boxes. Cupcake wrappers sold separately. NOTE: Only a few packs left! SIZE DIMENSIONS: 6 x 6 x 8 inches.